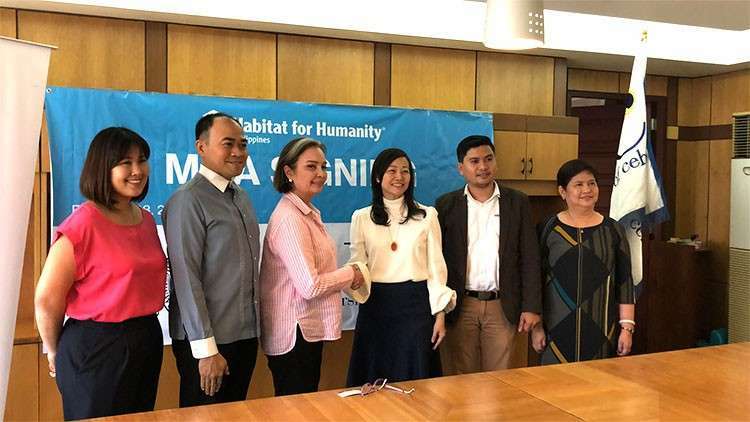 WITH hopes to create more residential places to accommodate sustainable communities in Cebu, the University of Cebu (UC) has officially partnered with the Habitat for Humanity Philippines. A memorandum of agreement between the two was signed Friday, February 8. The UC, with Chancellor Candice Gotianuy, donated a P5 million check to Habitat to fund housing projects, among other programs. Gotianuy said the P5 million donation can help build residential places for university teachers, employees and the community in general. "We are happy to have this opportunity to help the communities and we're starting with helping our own communities because we would like to spend part of the P5 million donation to Habitat to building houses for our own teachers," she said. Ambassador-trustee of Habitat for Humanity Philippines and Miss Universe 1973 Margarita Moran-Floriendo also graced the event. Moran, who has been an active Habitat volunteer for 20 years, said the organization promotes nation-building and she wants to help share that vision by getting involved in community projects and activities. "One way of being part of nation building is around you by getting involved. Starting with what are the issues, the problems, the successes and build on that and form solutions," she said.